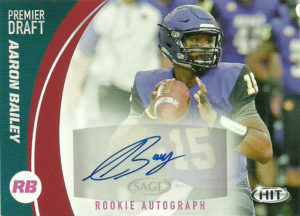 Aaron Bailey played quarterback at Northern Iowa. A dual threat both in the air and on the ground, Bailey transferred to NI in 2015 from Illinois. In just two years he posted 2,538 yards passing, and 1,760 yards rushing (25 TDs) for the Panthers. Scouts were unsure as to where the untamed Bailey would be a fit at, however his pro day was impressive enough to garner interest. Aaron went unselected in the 2017 NFL Draft. He’d be signed to a free agent contract by the Baltimore Ravens, and converted to wide receiver. Unfortunately Aaron suffered an undisclosed injury during training camp, causing him to miss the entire season. Currently he is a free agent. 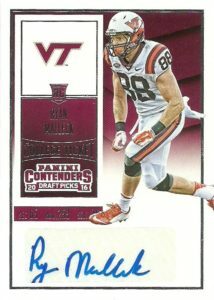 Ryan Malleck played for Virginia Tech from 2012-2015. He saw action in 33 games, recording 62 receptions for 658 yards and 4 touchdowns. Scouts felt he had the size to work the field as a tight end at the pro level but felt his blocking needed some polish. He went unselected in the 2016 NFL Draft. Since that time Malleck has stayed busy, logging time on the Giants, Steelers, Ravens, and later in 2017- the Houston Texans. He made his first professional catch while with Houston for 3 yards. Ryan resigned with the Steelers in 2018, but was waived and placed on IR for the 2018 season after an undisclosed injury. 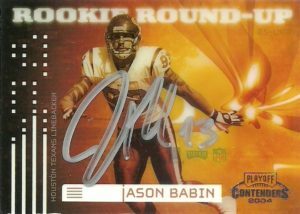 After his 2010 appearance on the Tennessee Titans, in which he earned his first Pro Bowl appearance and 12 sacks from the defensive end position, Jason Babin packed his bags and returned to the Philadelphia Eagles. While with the Eagles, he again notched a career high in sacks with 18 and the second of his Pro Bowl appearances. After having a fallout with management, Babin was cut after 11 games and finished his season with the Jaguars in 2012. He played the following year in 2013 with the Jaguars recording 7.5 sacks, before heading over to the Jets for 2014 where he saw his last meaningful statistics. Jason was on the roster of both the Cardinals and Ravens in 2015 and is presumed to be retired from the sport. With some great cards here of Jason, I really had wanted to get him over the years. 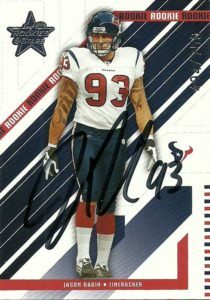 I had been advised by friends that he did football camps but after waiting for the past 3 years or so for him to pop up, I decided to just hit him up through the mail and it was a pretty fast turn around for the former Texan. I like the clean design of the Leaf Rookies & Stars card. The angled lines and slow evolution of this design really punctuated a solid overall look. I probably should’ve gotten one of the Longevity cards that I like, but this one still hits the mark nicely. I really like the Rookie Roundup Playoff cards, almost strictly because of the gimmicky translucency and credit card feel. While devoid of most color it does stand out nicely with an autograph on it- in which Jason kindly and painstakingly used a silver sharpie on.